I had a great childhood. I was spoiled. I had a ton of toys. And I took care of my toy. In fact, I took such good care of my toys that some of them were used by Andy when he was little. And my nieces and nephews played with them, too. There are a few toddler toys that I remember fondly… I’d have to say my favorite toy was my Radio Flyer horse. I got him for a Christmas present, so I named him Christmas. I cried when my mother insisted that I throw him away… and I was nearly twenty years old. Actually, I’m still pretty ticked that he’s gone. 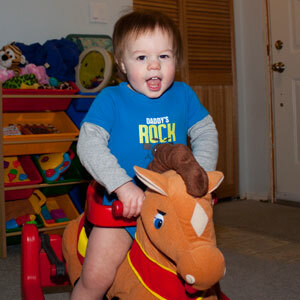 One toy that I really wanted to get for Norton was the Radio Flyer horse. I searched the internet and couldn’t find it anywhere in Canada. I was at the point where I was ready to go ahead and order a Radio Flyer rocking horse online, have it shipped to my friend Amanda or Lori, and pay a bazillion dollars to get them to ship it up to me. I was bound and determined that Norton would have a horse of his own, and he’d love it just as much as I loved my Christmas. The husband, however, was not quite as enthusiastic about my determination to have that horse, so I didn’t jump on the internet and order it right away. After a couple of emails, we were on our way to the guy’s house. And it was there and beautiful. We purchased it, loaded it in the van, and started our drive home. Then the husband and I started debating on what we would do with the horse. Did we let Norton try it out to make sure he liked it it and put it away for Christmas? Just put it away? Give it to him now? We had planned on letting Norton try it… but he spent so much time petting and loving his horse that we just let him keep it. It was a good $40 purchase. And it makes me happy to see Norton playing with one of my favorite things.